Sam Dickinson has hailed ‘relentless’ Calum Clark for refusing to sulk about being released by England. 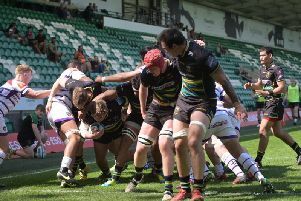 Saints flanker Clark earned a place in October’s EPS squad, but did not get the chance to represent his country during the autumn and has again been sent back to Franklin’s Gardens on a number of occasions during the Six Nations. That has not stopped the 25-year-old excelling for his club, with Clark one of Saints’ players of the season so far. And back row colleague Dickinson said: “It’s a good reflection on him that he’s not coming back moping or sulking. “He knows there’s a job to be done and he’s a great clubman. “He’s always talking to the boys and he’s always got a lot to say in meetings about what we need to work on. Clark was again one of the best players on the pitch as Saints battled to a 21-13 win at Bath last weekend. And Dickinson can’t help but be impressed by the contribution of the former Leeds Carnegie player. “CC is relentless, all over the place, tackling left, right and centre, making turnovers, which is what he does best,” said the No.8. “He’s been better than consistent. He’s been constantly improving and he’s a very driven character who puts a lot of pressure on himself to improve. “It is maybe a surprise he’s not playing for England, maybe not because the captain is at seven. “Maybe there’s a space to slot into around that, but I don’t know whether they’re going to change that any time soon. “It would be nice to see him get a shot.